Join Lisa on Tuesdays, February 5, 12, 19, & 26 from 12-2pm $105 plus materials. Elizabeth Zimmermann’s Baby Surprise Jacket has become near legendary since its publication in 1968. The jacket is knitted back and forth in Garter stitch, then cleverly folded and completed by weaving the shoulder seams. The jacket is knit in a single piece with just two seams that run across the shoulders and down the length of the sleeves. It includes extra ease across the back of the garment to fit well over a diaper. 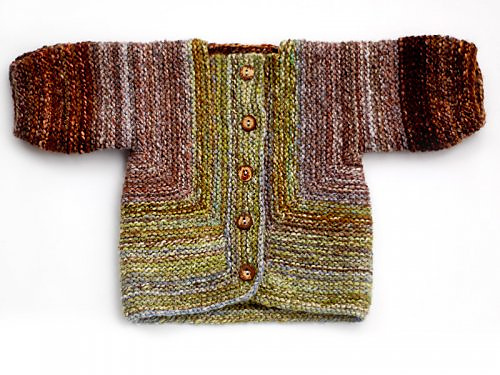 Commonly referred to as the “BSJ”, the baby surprise jacket is “a very entertaining piece of knitted engineering.” More than 26,000 knitters have made this and shared their projects on Ravelry. The possibilities are endless! Advance preparation may be required depending on the class topic. Details will be provided one week in advance or upon sign-up. Each weekly class session includes two hours of hands-on instruction, and extra help outside of class if needed and our time allows (it almost always does!). Yarn for classes must come from Compatto Yarn Salon, and we are always happy to help you choose the best yarn for your class or project. If you have questions about this or any other class, please give us a call at 310-453-2130. This entry was posted by compattouser1. Bookmark the permalink.